At this point in NBA history, there aren’t many “original” players. Today’s players are like players who have come before — in production, if not look and style. “This guy reminds me of…” is a game scouts and fans play, often to the point of absurdity. Following in the footsteps of basketball statistical analysts like MikeG and Kevin Pelton, I’ve created a Statistical Doppelganger machine of my own. The Machine compares players across 14 categories, including age, minutes, box score stats and my own overall rating metric Player Production Average (PPA). Then, it combines those differences and…voila…players with the smallest differences leap to the top of the list — similar production at similar age. The Machine uses pace-adjusted per-minute stats, but does not consider attributes such as height, weight or position. I’ll post results for Wizards players leading up to the season. These “most similar” lists ultimately work their way into my projection for the team’s record this season, which I’ll publish closer to the season opener. First up through the Statistical Doppelganger Machine: PG John Wall. While Wall’s overall production the past two seasons was flat (he posted a PPA of 139 in both seasons), his statistical similars is a good group for the most part. The average peak PPA for this group is 163, with Brandon Roy and Tony Parker at the high end and Kemba Walker (who’s still extremely young himself) and Robert Pack at the low. Note the presence of Hall of Fame PG Isiah Thomas, as well as several dynamic performers like Steve Francis, Baron Davis and Stephon Marbury. And keep in mind that while Marbury ended up as The Official Selfish Player of the NBA, he was a first-rate talent who was highly productive. For those who might be worried by seeing the names of Kenny Anderson and Robert Pack, well…stop it. 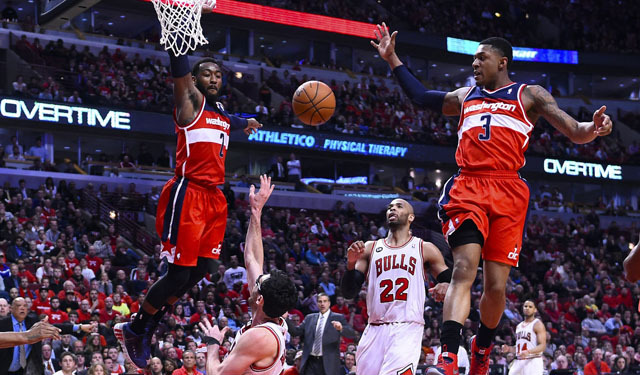 Anderson was a good player, but didn’t possess anything like Wall’s elite athleticism. Plus, Anderson’s performance drop-off wasn’t really until he’d reached his thirties — and more than 23,000 career minutes. Wall isn’t even halfway there yet. Pack was a not bad player when he could stay healthy, which really didn’t happen once he became a starter. In his best season, he managed to appear in just 31 games. Wall played more games than that in his third season, when he missed the first 33 games with a stress injury in his knee. In his four-year career, Wall has played every possible game for the Wizards twice. While I’m not giving away my projection for Wall (yet), these comps suggest good things. I expect Wall to improve this season, and to peak at an All-NBA level in the next few years. While I’m a big believe in Beal, I was not thrilled by this group of similars. Brandon Jennings? Twice? Really? OJ Mayo? Calbert Cheaney? Blech. If you want to throw out one of those seasons from Jennings, be my guest. Next on the list was Klay Thompson last season, Eric Gordon, and then a season from Mahmoud Abdul-Rauf. None of whom significantly change the analysis. There’s nothing particularly wrong with this group, except…none of them are Ray Allen or James Harden, or players of that caliber. For the most part, though, this isn’t a particularly impressive group. The average peak PPA is 128, which is about the level of an average starter. Only Jason Richardson from this list peaked at a level that typically earns a spot on the All-Star team. What’s kinda interesting is that there are “repeaters” on Beal’s rookie and second year lists. Again, not a bad group…just not as strong a list as I’d have hoped. Still, Beal is young and seems to have the work ethic to improve. My gut says his ceiling is higher than what the numbers are saying…but that could just be the fan talking. Next up: The Old Bigs — Marcin Gortat and Nenê.